Take good care of your instrument! In our previous article we dealt with maintaining healthy bodies to insure many wonderful years of playing. This time, let us concentrate on remembering a few basic points that will keep our instruments healthy and beautiful. Always wipe rosin off strings, fingerboard, and the wood body parts after practicing. Remember to wipe the bow stick, too. Avoid touching or holding die horse hair. Loosen bow hair before storing. Use a clean, soft cloth (an old cotton diaper (clean!!) works wonders) and keep it in your case. Keeping the instrument clean guards against rosin build-up. Rosin build-up can negatively affect the instrument’s tone. Use a fine grade clean steel wool on the strings to clear off the tougher rosin “barnacles.” Be careful not to touch the varnish with the steel wool, or let steel specks fall on the wood. One can “polish” one’s instrument two or three times a year. Sacconi violin cleaner, which can be purchased at most music stores, is one good type to use. It does not contain oil, so no wax build-up occurs on the varnish. The bridge should stand at a 90 degree angle to the top of the instrument’s body. If it leans, ask your teacher to adjust it, as the procedure can be a bit tricky. If a bridge is warped it should be replaced. 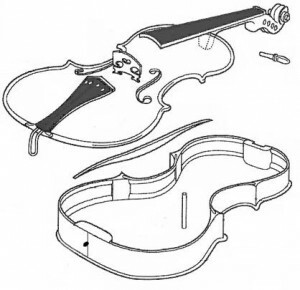 Violinists and violists should keep extra rubber bands, and cellists a good “rock stop,” in the case. EVERYONE should carry a pencil, for use in practicing, lessons, groups, classes and rehearsals! !